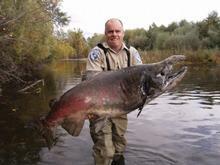 So here's something else...an 85 pound chinook in the Sacramento River in California. They figure it weighed 90 pounds or more when alive. And they also figure it wouldn't have spawned if not for the commercial salmon fishing closure down there.